This website highlights two major threats that cause much suffering to our local native birds and can result in their death. The first occurs when unwanted fishing line is carelessly discarded upon the ground. The second happens whenever a baited fishing line is left unattended in waters frequented by birds. Together these two acts injured more than 200 birds that I was called to rescue last year. Many of those birds were left maimed. Some didn’t survive. 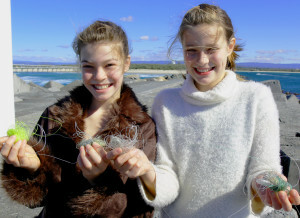 One of the greatest threats to native birds in the coastal area where I live is discarded fishing line. Fishers often discard line after re-rigging, or if it has become tangled. Too often that unwanted line is just dropped upon the ground, instead of being placed safely in a rubbish bin. I suspect few fishers realise this thoughtless act of littering can cause untold suffering to any bird that is unlucky enough to walk through the line and become entangled. 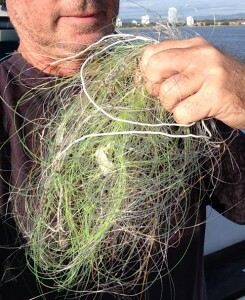 Thin, light weight fishing line presents the greatest risk because it’s hard to see and tangles very easily. Light braid is the worst of all. Any length of fishing line, 30cm (1 foot) or longer, is a threat to a foraging bird. If a bird lands upon, or walks through discarded line, there’s a high probability it will catch around its feet or legs. The bird will kick and peck in an effort to free itself. Sometimes this is successful, but in many cases it only causes the line to wrap more tightly around the affected limb. Soon the limb begins to swell from the pressure of the band of line. Because the line can’t expand it cuts deeply into the bird’s flesh. This is agonizing for the creature. A bird with a painful foot or leg injury will be reluctant to walk and therefore less able to forage for food. Unless caught and freed the fishing line will eventually amputate the limb, or cause infection, killing the bird. No species is immune from the dangers of discarded fishing line. From tiny doves to majestic eagles – all are at risk. To complicate matters a fish hook, or a fishing line entanglement, doesn’t usually prevent a bird from flying. That makes it very hard to catch and render assistance. It’s distressing for people to watch a bird suffering in this way and be unable to help. Only stumps remain where this ibis’s toes have been amputated by fishing line. The large number of entangled and hooked birds that I rescue in this area alone highlights the scale of the problem. Every year I catch dozens that would otherwise suffer a slow and painful death if not treated. Even then many are left partially crippled. When I first settled on the Gold Coast I quickly discovered that very few of the mature white ibis had a complete set of toes. Nearly every bird was missing toes amputated by fishing line. Some had lost an entire foot and were struggling to survive. Last year I caught about thirty pelicans and three times that many swans, all suffering from a fish hook or fishing line injury. Most were in serious trouble and in desperate need of help. The picture at left shows thin fishing line, with a swivel attached, wrapped tightly around the leg of a pelican. The line had been there for some time and was cutting deeply into the bird’s flesh. In fact the pelican was only days away from losing the use of its leg. Lighter species, like seagulls and ducks, can often manage with only one leg, but the loss of a foot is a death sentence for a heavy bird like a pelican or a swan. They simply can’t cope without both legs to support their body weight. Fortunately this pelican’s injury was discovered just in time. Happily it made a full recovery. At right is a lovely Brahminy kite. 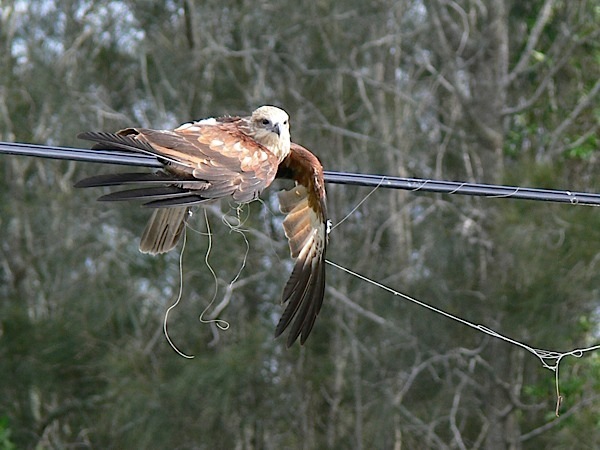 This kite was in serious trouble – lashed to a telecommunications cable by fishing line entangled around its feet. At times it was able to balance on the cable, but then it would fall and hang upside down for long periods until it managed to right itself. The bird had been hanging like this for many hours. We were very concerned the tendons in its legs would be damaged irreparably. 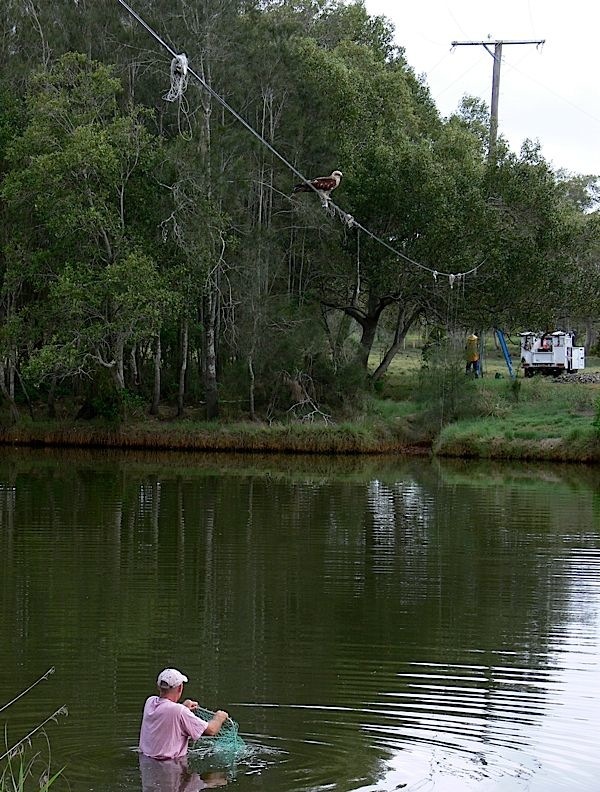 This picture shows the kite still lashed to the cable and me wading into the water. This was a tricky rescue because the kite was tethered 5 meters (17 feet) above water in the centre of a wide stream. I called the local power company. They were able to lower the 80 meter cable down to water level. This allowed us to wade out and get to the bird. Our local waterways are inhabited by bull sharks, the thought of which provided even great incentive to complete the rescue quickly. Below is a shot taken immediately after the rescue. You can see its talon tangled in several different weights of fishing line. There was also a lure, a single hook and a treble hook buried deep in the bird’s foot. The treble was the main concern because it had passed directly through the talon potentially disabling the kite and leaving it unable to fish. An injury like that threatens a bird of prey’s survival. We rushed the kite to Currumbin Wildlife Hospital where head vet Dr Michael Pine took x-rays and performed emergency surgery. Miraculously the barb had missed the tendons in the bird’s foot. Following two weeks of rest and rehabilitation the kite made a full recovery and was released back onto its home range. 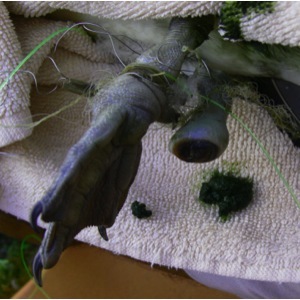 The picture below shows the legs and foot of a wood duck that had become entangled in fishing line and wire trace. The poor bird had been stumbling around like this for ages before I was informed. It took three weeks of patient work to catch her. During the rescue her right foot, which was dangling by a thread of skin, came off. 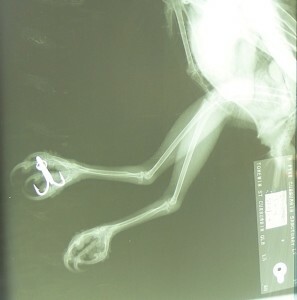 Fortunately the fishing line around that leg had amputated the foot cleanly. The flesh on the stump of her ankle had healed well (just above the duck poo). That still left an entanglement of wire and line cutting deeply into her other ankle. The line and wire was removed and the injury treated. I released her immediately and can report that she made a full recovery and retained the use of her one good leg. Although only able to hop she went on to enjoy a good life on the lake with her partner. There is a simple and obvious solution to the menace of discarded fishing line. NEVER DROP FISHING LINE ON THE GROUND. Instead, roll it up into a tight ball and tie it off, or cut it into short lengths before dropping into a rubbish bin (this prevents birds that are scavenging at the rubbish dump from becoming entangled). A second threat that causes so much suffering and injury is unattended fishing lines. 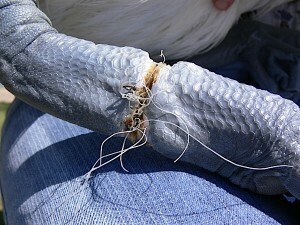 A bird can accidently become hooked if it takes a bait, however most of the hook injuries I encounter are the result of fishing lines being left unattended in waterways. Irresponsible fishers will sometimes cast out two or three lines in an area frequented by birds and then walk away and not check those lines for hours, or even days! Unfortunately this practice is still legal here, although we’re working with the Fisheries Department to change the law. An unattended fishing line can cause carnage to a bird that inadvertently swims through it. This happens often. The outcome is usually a hooking or an entanglement, or both. In most cases the fisher will be unaware that a bird (not a fish) has broken the line and left in distress with a hook in its body. The young swan pictured at right had swum through unattended fishing lines and got caught. The lines must have been rigged with multiple hooks because she had a hook in one of her feet joined by line to two hooks in her other foot. She had a fourth hook in the back of her calf and a fifth hook in her rear. Needless to say the bird was very distressed and in terrible pain. To make matters worse she’d inadvertently swum into the territory of two dominant swans and they were attacking her. She couldn’t escape because she was hobbled and in shock from the pain of her injuries. I caught the swan and rushed her to hospital where she made a full, albeit slow, recovery. 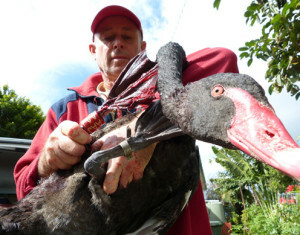 Recently a near tragedy involving an entire family of black swans was caused by unattended fishing lines. The two adults and their four very young cygnets (baby swans) lived on a local waterway and were the delight of residents. The family set off early one morning and must have swum into two or three lines left out unattended by a fisher. The mother and one of the cygnets became entangled in the same line. The cygnet drowned as the mother tried frantically to free herself. Meanwhile the father also became hooked. His injury wasn’t discovered until the following day when we noticed that he was limping. Mum was last seen towing her dead cygnet away up a canal and eluded all efforts to find and help her. This left dad to care for the remaining three cygnets. It took two days before I was able to catch him and his three kids. All were bundled off to hospital and the hook removed from his thigh. The mother was still missing and feared dead. To my great relief she turned up two days later having freed herself from the dead cygnet. The picture above shows mum (behind) re-joining her family after the remaining fishing line had been disentangled from her legs and wing. 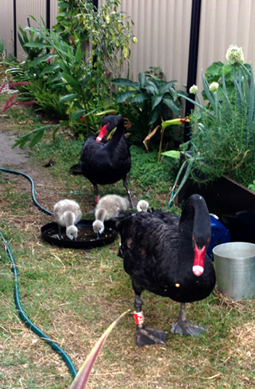 This family had lost a cygnet because fishing lines had been left out unattended overnight. The outcome could have been much worse. Fortunately there a simple solution to the deadly threat caused by unsupervised fishing lines. NEVER LEAVE A FISHING LINE UNATTENDED … not even for a few minutes. It’s not illegal to accidentally hook a bird. If it happens pull the bird in and de-hook it. If the hook is too deep to remove, contain the bird and call for help, or take it to the nearest vet so the hook can be surgically removed. Most vets will treat native wildlife for free. If the bird breaks free of the line call for help immediately and keep the creature in sight so that a rescuer can find it. Quick action is vital otherwise a ‘flight capable’ bird might swim or fly away making it difficult to find. Place all unwanted hooks and line in a rubbish bin. Never leave a fishing line unattended. 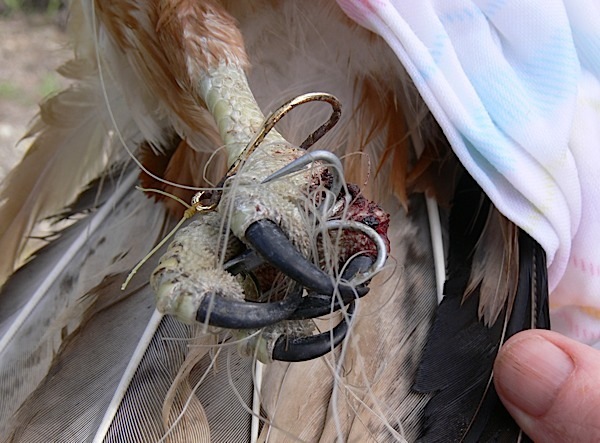 If you hook a bird, contain it, or keep it in sight and call for help immediately. I encourage everyone to collect and safely dispose of discarded fishing line, wherever it is, but please take care, because a length of line will sometimes have a hook or hooks tied to the end. Hooks can cause a painful injury and may even require surgery to remove. If you do accidently prick yourself with a hook, wash and disinfect the wound and ensure that your tetanus vaccination is current. Birds have to cope with many natural challenges in the wild. They also have to contend with introduced predators like cats and foxes and man-made threats from hunting, poaching, loss of habitat, loss of food and ever increasing levels of pollution. In this article I focus on one threat only. It’s a nightmare that’s currently unfolding in the deep oceans that too few people know about. Not only is it killing tens of thousands of seabirds but it also has far reaching consequences for humans. I’m talking about the looming disaster caused by plastic. This is something we all need to know about and must act upon because plastic doesn’t just affect birds. It’s destined to have a serious impact on every aspect of life on Earth. Plastic is one of the most useful materials ever invented. Take a look around. Unless you live in a wilderness chances are you’re surrounded by products made of plastic. We drink from plastic cups and bottles – package, transport and store our food in plastic – build phones, toys, computers and the interior of cars out of plastic. In fact it’s a major component in countless consumer and industrial products. Plastic is EVERYWHERE. Plastic isn’t a natural product. It’s chemically derived from petroleum. And here’s the scary part. Plastic doesn’t bio-degrade – it only photo-degrades. That means instead of breaking down into biodegradable components that can safely integrate back into the earth, plastic just breaks down into smaller and smaller particles of plastic. It never goes away. So many of the plastic products we use daily, like fast food containers and packaging are used once and then we discard them. 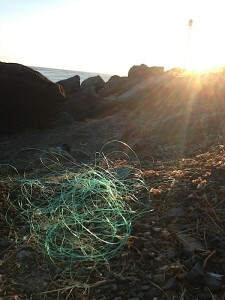 As the 5 Gyres website says … ‘plastic, made to last forever, designed to throw away.’ http://5gyres.org/ . To make matters worse plastic doesn’t recycle easily, although I’ll talk more about this shortly. You may have heard of the North Pacific Gyre … aka, the Great Pacific Garbage Patch. It’s a large area of the Pacific Ocean, a few hundred miles north of Hawaii. The Gyre is like a giant, slow moving whirlpool that draws everything in. Estimates vary but it’s thought to be about the size of Texas. Some say it’s much larger. Countless tons of trash, including a lot of plastic from countries bordering the Northern Pacific Ocean, accumulates in the Gyre. Capt. 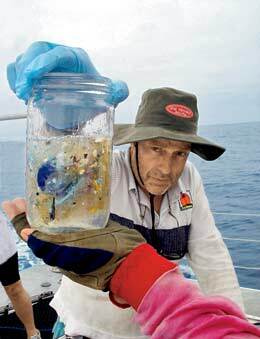 Charles Moore has spent years conducting trawls through the Gyre in his research catamaran Alguita. Typically most of the plastic pieces he finds are from 5mm down to 0.3mm in size, and right down to polymer sludge. The trawl samples contain tiny particles of plastic that outnumber the sea life six to one. The greatest concentration is at the surface but plastic particulate extends top to bottom at all depths of the water column. In some areas trawls have produced samples with a plastic to plankton ration as high as one thousand to one. The horror of this statistic becomes evident when you consider that many creatures live on plankton, which is similar in size to much of the plastic waste. This includes most of the great whales like blue whales, fin whales and humpbacks. These beautiful creatures are being forced to eat our discarded, toxic plastic! The North Pacific Gyre is only one of several areas throughout the great oceans where a huge amount of plastic is accumulating. Watch compelling vision of Capt. Moore’s voyages into the North Pacific Gyre. Plastic has countless, useful applications but it also has some truly unsavoury characteristics, not the least being its role as an endocrine disrupter. The endocrine, or glandular system, produces hormones that play a key role in every aspect of human and animal physiology, including growth, development, reproduction and mental health, to name just a few. You don’t have to be a medical expert to envision the consequences of endocrine disruption. If the fish we eat are consuming plastic, the chemicals in that plastic get passed on to us in their flesh. Birds eat those fish too. They also mistake particles of plastic for food. Contamination is happening in all birds and predators that rely on fish and plankton as a food source. The persistent toxic compounds in plastic unbalance the endocrine system, which intern affects reproduction and can cause genetic changes. Who knows how all this will end, but unless we act decisively to limit our use of plastic you can bet it won’t be pretty. Modern medicine has few answers for the many degenerative illnesses that blight our lives. Yet common sense says that increasing levels of pollution must be a factor. The obvious solution would be to drastically reduce pollution, especially the dumping of non-biodegrading materials like plastic, before a full blown crisis develops. Instead we worship the convenience that plastic offers and pay homage to multibillion dollar pharmaceutical corporations that produce expensive drugs in an attempt to counter the symptoms of degenerative illnesses. Many of those illnesses are thought to be exacerbated by the burden of environmental toxins now being found in every person who is tested. Those toxins are coming from industrial pollution and increasingly from the polluted seafood we eat. Watch the damage that’s occurring to seabirds from eating plastic. When I was a kid there was very little plastic. Drinks were served in waxed paper cups or in glasses. Beverages and sauces were sold in glass bottles. Vegetables and fruit from the grocer and supermarket was packaged in paper or cardboard, or sold in glass containers or steel cans. If you ordered freshly cooked fish and chips, a family favourite, it would all be tipped onto a piece of grease proof paper and then wrapped in newspaper. Nobody got sick from any of these materials. When they were discarded they didn’t pollute the Earth. A refundable deposit was paid on every glass bottle purchased. This guaranteed that nearly all were collected. Cashing in those glass bottles was how kids like me funded our holidays! The same should be done now for plastic products to ensure their return. Paper, cardboard and glass might not be quite as convenient or robust as plastic, but these materials are available; they’re cheap; they’re recyclable and they’re fully biodegradable. Steel is very robust and it’s also fully biodegradable and recyclable. This shows we already have all the raw materials we need to produce safe, recyclable packaging right now. We don’t need packaging made from a material that is so environmentally unfriendly it threatens to kill entire species of birds and other marine life while haunting us with nonspecific illnesses for generations. History shows that we humans often stubbornly resist change until negative consequences of our actions so overwhelm us that we can no longer ignore them. Therefore the polluting, poisoning and heating of our planet is likely to go on for some time – until it really hurts. Hopefully by then it won’t be too late to drag our precious Earth back from the brink. One thing is certain – our grandchildren will spend much of their lives cleaning up the toxic mess we’ve created during the past 50 years – a problem that grows bigger by the day. Hopefully they’ll succeed. Their very life and the life of every creature on the planet will depend upon it. A Ray of Hope – thank God! Plastic is not an easy material to recycle, however a Japanese man has invented a simple machine that converts waste plastic back into oil! This oil can be used for heating, or to power cars and machinery. His device is brilliant. Along with a big reduction in our use of plastic, it could be the saviour our planet desperately needs. Watch video of his invention below. All this talk of doom and gloom is only useful if it spurs us into positive action. You might feel powerless to do anything about the plight of seabirds seriously affected by plastic, or the threat that plastic poses to human health, but nothing could be further from the truth. You have power in your voice and in your actions. When enough people speak up, things will change. The first thing you can do is help get the word out. The more people who are aware of the crisis being caused by discarded plastic the sooner something will be done to stop it. Research the damage caused by plastic. Tell people that discarded plastic doesn’t biodegrade; it hangs around for centuries. Tell them that seabirds are getting trapped in plastic debris and dying after ingesting plastic. Explain how the plastic we are throwing away is not just affecting birds, fish and whales but that it’s having a growing negative impact on human health. Reduce your use of plastic and campaign to demand that a refundable deposit be paid on every plastic bottle purchased. Get involved with an organisation that monitors the effects of pollution and global warming. Join a wildlife group. Educate yourself with a view to finding a project that you can be part of and become a conduit for positive change. Do whatever inspires you. The more people who make an effort, the sooner change will come. Remember too that nature has the most extraordinary powers of regeneration, given the chance. In time she can clean up the plastic mess we’ve made, but only if we stop adding to it.